Before baseball became a year round, non-stop 24/7 bombardment of news, with the winter months filled with rumors, free agent signings, trades, blogs, tweets, press conferences, MLB Network, ESPN, and Tommy John surgeries – we could pause after the World Series, catch our breaths, and gently count the days until spring training. Digest size, it would catch one’s eye with its distinctive red cover, and the sight of it would bring joy and hope that the new season was almost here. It first appeared in 1912 when William Howard Taft was in the White House, and as Taft was also the first president to throw out the ceremonial first pitch of the season – the coincidence seems appropriate. At a time when the president deemed it worthwhile to christen a new season, the publisher of Baseball Magazine deemed it a good time to give the fans a guide to all the big league players, while getting their statistical house in order. It likely took its name from Marquis’s Who’s Who in America, first published in the U.S. in 1899, and by 1912, well established as a prestigious directory of the nation’s movers and shakers. To get into Who’s Who in Baseball, one needed to be on a Major League roster in 1911. To baseball fans, that was prestige enough. Fans were probably delighted. By today’s standards, it didn’t offer much – games played, batting average and fielding average were all you got, and let’s face it, who has ever cared much for fielding average anyway. But you had all the players alphabetically, with their height and weight and birthdate, their full name, and of course, whether they batted or threw right or left handed. It had a generic cover, sold for 30 cents, and probably didn’t sell all that well, because Baseball Magazine put the idea to rest for another four years, before bringing out a 1916 edition, with Ty Cobb gracing the cover. That 1916 edition was deemed by the publisher to really be the first edition, so that in 2015, a 100th edition was published, (even if it was really the 101st). Yes, for all the twists and turns to baseball stats, to all the movement to online presentations, to the rise and demise of The Sporting News’s heftier Baseball Register – Who’s Who in Baseball endures. It is comfort food for the baseball soul. Always has been. Its evolution has seen it pass through the hands of some of the legendary statisticians in the game’s history. Always it has been there for the avid fan, the casual fan, the sportswriters and broadcasters, the team executives, and yes, even for the players. Baseball Magazine was only four years old when they put out that 1912 edition. The magazine continued to publish until 1957, and while it never had the cachet of “The Bible of Baseball” like The Sporting News did, it was appreciated by fans who enjoyed offbeat or character studies of players. For a big event, like the opening of Yankee Stadium, they could deliver strong issues with in-depth reporting. The 1912 attempt at stats for fans in a handy size was a noble idea, and there was no shortage of progressive thinking at the editorial desks of the magazine at 70 Fifth Avenue in New York. In fact, in 1922, their publication of The Baseball Cyclopedia, edited by Ernest Lanigan, was the first 20th century attempt at listing all players in history. Lanigan took over in 1922. Whether his tenure was brief or long is uncertain, for he was only listed for two years before the title of editor dropped from sight. But to have him associated with the book added a lot to its credibility. He is the man most responsible for the official acceptance of runs batted in as a statistic, and he later became the curator at the Baseball Hall of Fame when it opened its doors in 1939. Remarkably, Who’s Who did not include home runs as a category until 1940 – five years after Babe Ruth’s retirement. One can only imagine the editorial discussion at the Baseball Magazine offices after Ruth his 60 home runs in 1927. And so the 1928 edition would give the reader games, at bats, runs, hits, stolen bases, and average. The reader would know that Babe had seven stolen bases in 1927, but not 60 home runs. Crazy. The introduction to the book in those days made clear that it was “devoted to the better known or more talented players of the two major leagues.” In future years, that would expand, eventually causing the book to move from “saddle stitch” binding (staples), to a “perfect binding,” (glue, with a spine). As baseball expanded, first in 1961-62, and then in 1969, 1977, 1993 and 1998, the book had no choice but to grow bigger and bigger. The 1962 edition was the first to exceed 500 players, and in 1969 it went over 600. Today it approaches 800. The 1952 edition had 128 pages, up from 96 the year before. In 1969, when four teams were added to the majors, the trim size of the book grew as well, up to approximately 5×8 (as it remains today), from 5×6. Photos of the players first appeared alongside their entries in 1965. For a few years in the 1970s, there was an alternate blue cover, an edition printed expressly for Scholastic Books. But red has prevailed as either the trim or the full cover, for the run of the publication. When The Sporting News introduced its annual Baseball Register in 1940, the popularity of Who’s Who remained intact largely for its portability. Both publications listed a player’s minor league years along with major league seasons, a feature that remains important and intact in Who’s Who today. The Register’s last edition was published in 2007. Clifford Bloodgood was listed as editor from 1940-51, followed by Joseph Lilly and Sid Feder. Then the publication fell into the hands of Harris Publications, a family owned publisher of many magazine titles. Harris continues publication to this day. Harris hired Allan Roth, who was also serving as the Brooklyn Dodgers’ statistician, and who continued until 1973. Roth is considered one of the great statisticians in baseball history, and at the time, no teams employed anyone in such a role. He took record keeping to new levels, recognizing many of the tenants that helped give birth to the Society of American Baseball Research. Roth was a God-like figure to the early SABR people, and his connection to Who’s Who added great credibility to the book. In 1973, the Elias Sports Bureau took over the editorial responsibility, as Seymour Siwoff and his staff took it on for a decade. In 1983, Norman MacLean, assisted by the great sports historian Bill Shannon, assumed the editorial work, later assisted by Pete Palmer and a number of others. Palmer, also a towering figure among the stat-loving public, took full charge in 2008. The individual player entries tended to grow as baseball changed some of its rules. When players on the disabled list were allowed to “rehab” in the minor leagues before returning to their teams, that created an extra line, even if it was only for a game or two. There would be few players – Bob Feller comes to mind – who never played in the minors, and then played their entire career in one city with one team, as Feller did with Cleveland. That “perfect entry” of his was rare. Then there were people like Rudy Seanez, a pitcher with a lot of frequent flier mileage, who appeared for the last time in the 2008 edition. (Maybe Rudy was the reason The Sporting News Register shut down after 2007). Seanez’s entry took 45 lines of year-by-year stats to cover his 16 seasons, with an additional six lines for the post season and two lines of career total, and then came the listing of his trips to the disabled list – 12 – and the times he filed for free agency – also 12 – plus the five times he was released and the five times he was traded. Rudy did pitch in the minor leagues in 2009, but by then, he was gone from Who’s Who, presumably to make room for four or five additional players. I wonder if Rudy Seanez knows about this? I wonder if he knows that along with Hank Aaron, Derek Jeter, Jackie Robinson, and Yogi Berra, he never made a Who’s Who in Baseball cover. 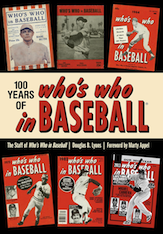 Doug Lyons has done a great job in covering the evolution of the cover subjects and taking us through baseball history over the last 100 years as well. It’s a journey worth taking, and thank you Who’s Who for still being part of our love affair with baseball.